Bob Lotich and I actually go way back to the year 2009 when we both started blogging at roughly the same time. Bob runs the extremely popular blog ChristianPf.com where he makes a very healthy income writing about faith and personal finance. In this interview, he shares a bunch of his secrets on how he makes money and how he fully leverages various social media sources to generate traffic for his site. He’s also written an incredibly detailed book that teaches others how to blog as a profession. You are listening to My Wife Quit Her Job podcast where I bring in successful, bootstrapped business owners, to teach us what strategies are working and what strategies are not. Now this isn’t one of these podcasts where we bring on famous entrepreneurs simply to celebrate their success. Instead I have them take us back to the beginning and delve deeply into the exact strategies they used early on to gain traction for their businesses. If you enjoy this podcast, please leave me a review on iTunes and enter my podcast contest where I’m giving away free one on one business consultations every single month. For more information go to www.mywifequitherjob.com/contest and if you are interested in starting your own online business be sure to sign up for my free six day mini course where I show you how my wife and I managed to make over 100K in profit in our first year of business. Go to www.mywifequitherjob.com for more information. Now onto the show. Steve: Welcome to the My Wife Quit Her Job podcast. Today I’m thrilled to have a good friend of mine on the show Bob Lotich. Now if you don’t know who Bob is, he blogs at ChristianPf.com, which is a very popular personal finance blog tagging towards Christians. And Bob probably doesn’t know about this, but one of the posts he wrote about making money blogging from like three or four years ago was actually one of the inspirations for me monetizing my blog in the first place. Anyways Bob’s site is really quite remarkable; he’s got a really large email list at over 50K. He’s gotten around 22 million visitors total since 2007 you know, and quite honestly his blog gets way more traffic than mine, and he’s also written several books, he offers free courses that helps others become financially secure. So without further ado welcome to the shoe Bob, how are you today man? Bob: I’m doing great and I’m really excited to hear what you just said about reading that article, so that’s really exciting. Steve: You know I actually went to look to look for it last night and I couldn’t find. It was just this monster post on how you made money online with AdSence a long time ago. I don’t know if you remember which one I’m talking about? Bob: yeah, I mean I haven’t written much about blogging on the site, so I know exactly which one you’re talking about. Yeah, it’s ChristianPf4/blogging. Steve: Okay, I’m going to find it. Okay, yeah because I know you’ve kind of organized your materials in lots of different categories for ease of finding but for some reason I couldn’t find that post last night. Steve: Anyways, okay yeah seems like you know a lot of successful personal finance bloggers I know kind of started out heavily in debt before getting themselves together. Did you kind of come from a wealthy background or did you have financial hardships in the beginning prior to starting this online business of yours, and how did you kind of come up with the idea for starting ChristianPf in the first place? Bob: All right, let’s tackle those one by one. So, first of no, not at all wealthy, had a lot of debt myself, and I found myself in a situation where I was like 20 years old, 20, 21, somewhere there, and I had moved out of town. I moved down to Florida just kind of just I don’t know– go hang out, do whatever and I ended up spending all my money wrecking up, basically maxed out my single credit card and I always laugh about how I was naive enough to think that I could only have one credit card. So, that was my saving grace that I really believed I could only have one credit card. So I ended up max up my credit card. It just kind of brought me to this point where I realized I got to make a change, and so for me that was kind of the impetus behind the whole thing. And from that point I just started you know reading other personal finance blogs, reading magazines, reading books, everything I got my hands on just trying to figure out how to improve my own finances and my own financial life. And so that was kind of my phase that I was going through and that kind of led into ultimately starting ChristianPf, because I was learning about all this, then I was also finding out all these things in the Bible said about money which I thought was fascinating that this old book had some relevant and timely information. And so then I just kind of combined the two into a ChristianPf where we just kind of focused on money management, but kind of geared and focused towards Christians, you know looking at some of the Biblical aspects of things and things like that. Steve: So was your motivation for starting ChristianPf to make money in the beginning or was it to compile information, was it more for yourself? Bob: You know I forget a little bit, it’s like I knew I remember I had read ProBlogger, Darren Rowse’s site and I knew that there were a couple of people out in the world who were making a full time living. I knew there were a few more who were making some money, so it was kind of in the back of my brain, but at the same time I knew it was a little bit long shot. But for me mostly I was just so fueled by this topic, and I was just excited about it and so I just saw it as an outlet, as a way to just kind of communicate with others and you know when they say that the best way to learn is by teaching, and so just by me talking about it and kind of writing about a lot of the things I was going through, it helped make it more sound in my own life. So, I think that was the main motivation, I think there was a little bit of man if I can make a few hundred dollars a month from this, it would be awesome, but that’s pretty much where I was. Steve: So were you working full time when you started ChristianPf? Bob: Yeah, I was working at– I worked in the banking industry for a while then I switched over to a brokerage firm and did that for I guess about five years I was there. Steve: Okay, so you started it while you were working and then you eventually quit I would imagine? Bob: Yeah, well I got laid off. So you know I had a plan, you know once the blog was up for a while, I had this kind of longer term goal. It’s like all right I want to be able to get this thing up to my– to surpass the income I’m making from my day job and I saw this is like probably three year goal, and I got laid off about a year into that phase. Bob: So anyway, so my wife and I talked about it, we prayed about it, we looked at our bank account, we looked how much money we had saved up, we looked at the severance package I was going to get and anyway I just– I went with it. I didn’t get a job after I get laid off and I focused full time on ChristianPf, and within about nine months, we were able to get it up to the point where it surpassed a day job. Steve: Wow, that’s awesome. Okay so– but it was already making money before you got laid off kind of right? Bob: Yeah, I was making a little bit but definitely not enough to pay the mortgage or anything, so it was no catch. Steve: Okay, we will have to definitely talk about that growth. So, before we get into that you know how does ChristianPf make its money primarily? Bob: We have about three main revenue streams, so AdSence being the cost per click is a big portion still, it’s always been a big percentage for us. And then we also run another CPM network and so we’ve been on ads and things like that generate some income. And we increasingly been doing more with affiliate marketing and finding great products that we like and talking about them on the side, so that’s become another big stream as well. And the books are increasingly as I write more and more becoming a bigger portion of the income as well. Steve: Okay and so you mentioned– actually which affiliate networks for the banners do you actually use, just curious? Bob: Well I don’t– just to be clear I don’t use, I generally don’t use any affiliate banners but my further CPM networks. The CPM network I’m working with right now is my bank tracker, but affiliate networks has a ton of them I mean CJ and Linkshare and I don’t know [Inaudible] [00:08:28] I guess there are a million of them that I use. Steve: Okay, and so you mentioned that you grew your site to full time income essentially in nine months. So, this is back when your site was much younger. So how did you actually gain traffic to your site early on, basically when you weren’t getting that much traffic? Bob: Yeah, for me a lot of it was guest posting. I mean so much and this is what I’m always recommending in a blogger’s, you know and [Inaudible] [00:08:53] came out a few months ago and said something about guest posting, it’s dead, it’s– you know and his point was, it’s become a spammy tactic and that’s absolutely true. I get emails every single day from all kinds of spammy companies wanting to guest post on my site and I turn them down. But legitimate good guest post, which Mattes [phonetic] specifically says are fine really I think is a great way still to build an audience and build blogs and that was a really big part of my growing my traffic. And so I found any site I could write on. Some of them were blogs, some of them were article sites, I mean any place I could write and get an article in front of some eye balls, that’s what I was doing and that really helped– that really made a big difference in getting a lot of traffic, in helping grow my audience. Steve: Okay, so you primarily attribute to guest posting and then of course the quality of the content. I still remember that blogging article, it was probably like 3000 words or something I remember but it was very well written. Steve: Was it 8000, shows how long it’s been since I’ve seen it but yeah that was one monster article that actually inspired me. So, in general for the guest posts have you been just making friends in the finance blogging industry in order to get those opportunities, or how have you actually gotten those guest post opportunities? Bob: Yeah, that’s another thing that back then you know we’re talking 2008 there, it’s five six years ago. It was a lot easier you could pretty much email anybody and say ‘hey I’ll write you a good article’ and they be ‘all right, okay I’ll put it up.’ And now because it has become more spammy and so many people– so many companies trying to do it, it does really help to have a connection and to know the person who you are emailing. So anyway so yeah I mean I do think that’s a rule they help and now that’s pretty much all I do. It’s like if I send a premium article to a random blogger who I don’t know, they rarely get accepted, and so the best way to fix that is just to connect with that other blogger and get to know them and offer something and give something upfront. Be of benefit first and it just seems like things work a little bit better that way. Steve: Yeah so just as an aside for the listener’s, Bob and I actually have gone back quite a ways in terms of just blogging, but we recently met in person the last couple of years at the financial blogging conference. And incidentally that is how Bob and I kind of got in touch with this podcast interview. He has a new book coming out, he just kind of reached out and of course since I’d met him a couple of times in the past, by all means I wanted to interview him and have him on the show, so just as an aside. So you know Bob, hey you had a bunch of books that you’ve written, I’ve actually looked at your Amazon account and you’ve been quite prolific. And you’ve also created a bunch of these free courses for people in dead end– you write a lot of posts for the blog. What is kind of the master plan, I know that’s kind of a vague question here but I know you know there been a whole lot of people– blogging has become really popular and there’s more and more people entering the blogging space, making it kind of more and more saturated as time goes on. So are you still focusing all your energies on the blog or you are kind of branching out more to these posts, free courses, are you thinking about starting a podcast, you know what’s the long term strategy for ChristianPf as a business? Bob: You know essentially what we’re trying to do is– I guess where my goal has been how to transition is I just want to help the readers in whatever I can do to help them reach their goals. And it took me a long time to realize that the blog by itself was not helping a lot of them reach their goals, and once I realized that, that’s when I started creating these courses and so we have like you mentioned a couple of free email courses that people would sign up for, and then it takes them through a series of articles, and it’s– they are just articles that were from the site but they are packaged together in a way that it seems to offer a lot more benefit than when they are just kind of randomly coming at you in the newsletter or you know via the blog every other day. So that’s kind of the reason that we’ve shifted in what we are trying to do, I mean it’s the same with the books. So as far as the big master plan, I’m just going to keep doing whatever I can do to help the audience in whatever that’d going to help people learn best. You mentioned podcasts, it’s funny I started a podcast like five years ago and we did– I don’t know five or six episodes or something and we haven’t done anything with it since and now I see you and a whole bunch of other guys really getting into the podcast thing, so it’s kind of my wheel spinning away but anyway, kind of tent hitch. But yeah, as a far as the big master plan it’s just focused on the audience and whatever we can do to help them in whatever that’s going to be. Steve: Okay, did you have a paid course or were these all just kind of free courses? Bob: These are all free courses right now and part of how we off set the work and time invested in the whole thing is throughout the courses, there are different affiliate products that are mentioned and so they generate some revenue, and that just helps offset some of the costs of doing it. Steve: Okay, so in terms of how ChristianPf actually makes money, which strategy is actually been the most effective. So we’ve talked about cost per click, we’ve talked about CPM banners and we’ve talked about kind of affiliate offers and selling eBooks. So, which one has worked out the best for you and which one is most lucrative? Bob: I mean it’s kind of a dynamic thing you know it does shift year to year depending on what’s going on with Google and other things in the industry and things like that. But I mean we’ve always been heavily– our revenue is always been heavily weighted in Google AdSence, so that’s always been a really big portion of our income. Now, that said, I’ve always been fighting and working to diversify that as much as possible and minimize that. Historically I’ve just had way too much dependence on Google. In general I’m really excited about Google because I wouldn’t be able to do what I’m doing, I would never have been able to do this if it weren’t for Google but still I want to diversify as much possible. So AdSence has always been a big, big chunk. Affiliate revenue has gradually increased over the last few years and so now at this point, the affiliate revenue is probably 50%, AdSence is may be 25% both since somewhere in the [Inaudible] [00:15:38]. Steve: And where do the books kind of fit into this revenue model? Bob: I don’t know, we’re there probably 5-10% somewhere in there right now. Steve: Okay, so this is– to the books is that something that you’re trying to grow in the future, or you’re trying to focus more on affiliate revenue? Bob: It’s both, I mean I’m not trying to just completely focus on one or the other, I mean the blog’s going to continue with I think 2000 articles on the site now, and we’re trying to make the most out of the articles that we already have there, but we’re going to continue to publish and create helpful stuff. The books– I actually enjoy the process of creating the books and writing and publishing the books and it’s like I said, it’s just another way to get a lot of information out. There a lot of people who won’t read a blog but who will read a book and who want to be able to carry it with them or and so we need to serve those readers. And so honestly– and so the revenue, I mean we have been making a little bit from the books, but even if we weren’t I would still probably be doing it just because it helps the readers so much. Steve: Okay and you find that you are able to drive some of the people who are reading your books back to your blog? Bob: That’s a tricky thing to measure; I wish I had a better way of tracking that. I’m experimenting with some stuff, one of my– actually my last book I just launched last week we’re– I put a– I basically created a new URL that I’m going to be sending people from, so pretty much the only way people are going to be able to find that URL is via the book, so it’s going to give me a good idea of how much traffic we are generating from it. Bob: But that’s kind of my first attempt at trying to track this, so. Steve: Okay, and so we’ve been talking a lot about traffic and I know you know Google is kind of been in a flax for the last two or three years I would say, and you’ve kind of mentioned that first a vacation, and at least with my blog I find that the majority of people clicking on AdSence ads are coming from search, so how have you kind of diversified your traffic sources? Bob: Well for me it’s been a big– I just didn’t care about social media traffic at for really the whole time. I mean I was doing so well with Google and I was getting me so much traffic from them that I just didn’t pay attention to social media, and in about a year and a half ago or something, Google began to pull back a bit as far the traffic we were getting from them and it just kind of forced me to go out and figure out how to start getting some social media traffic. And anyway so we have been focusing a lot of energy in the last I don’t know nine months or so on Facebook and maybe the last three months or so on Pinterest and that yielded pretty good results so far. Steve: Okay so yeah let’s talk about Facebook, I know you’ve had a lot of success in growing your fan base tremendously. So you know any tips on how to build up your Facebook fan base, and how did you manage to grow it so quickly? So I think you have like almost 40k funs at this point? Bob: Yeah, October of last year, October of 2013, we had about 13,000 Facebook fans and that took us about five years to get those 13,000 fans and which I was like fired, I was happy to have 13,000 Facebook fans but I knew we could do better, I knew we could grow it, I knew there were other people out there who wanted to be fans and so we did put all our energy into it. And so one of the things– the big kind of revolutionary thing that I think made the most difference for us was we stopped only posting our articles. So for the longest time that’s all we did, was we just whatever article went up that day we would post it on Facebook and be done. And you know I sat and thought about it and I was like this is just kind of selfish, it’s like all I’m doing is telling people here is what I just did, here’s what we just did, go look at it and I’m not giving this audience what they want. And we came to discover that our audience was interested in a lot of different things, and so e began sharing quotes– encouraging quotes and we’d share Bible verses that are specific to finances or whatever. We would ask engaging questions and try to get them there, we would share funny videos or whatever it was, and so some of the stuff was you know wildly off topic, but it was still stuff the people really enjoyed. And so if the audience enjoyed it, even if it’s off topic, why not share with them. And that has made a really, really big difference for us. So we made that shift and began probably maybe one out of every seven, eight posts was about one of our articles and everything else was just stuff for the readers, just stuff for them to enjoy and that really helped us grow pretty quick. Steve: Okay, so I would imagine though that you know this involves posting more frequently, so how do you kind of manage your time with respect to managing your different social media outlets like Facebook? Bob: Buffer, buffer is all awesome, I absolutely love it. Steve: So how many posts would you say that you buffer up, do you like buffer up a month’s worth, a week’s worth, a day’s worth, how do you kind of handle your social media? Bob: It is always at least a week you know when I’m doing really well and have a big chunk of time to devote to it, and my wife helps me with this as well. She’s pretty heavily involved in our Facebook page and a Pinterest app. When I get a big chance, we’ll get out two or three weeks out ahead, but we’re always at least a week out. Steve: So how do you decide what you are going to post there, so if you are not posting your own articles the majority of the time, what sort of topics do you focus on? Bob: well, we just started experimenting, because I didn’t know it was going to work. I didn’t know if quote was going to do well, I didn’t know if something funny was going to do well, I didn’t know if a video would do well or you know what. So we just started trying different stuff and you know the Facebook kind of analytics is pretty good, you can see what’s working and you can see how many times it’s shared and liked and whatever else. And so we just tried a bunch of stuff and just kind of evaluated that, and then started focusing more on the things that were working. And so for us it was a lot of quotes, it was a lot of Bible verses and you know funny stuff, and figuring all that out it takes a good amount of time and we had some mistakes and we had some things that were just complete flops that we thought were going to be success. But you just do it, do it and do and hone it and hone it and you get better and better at it. Steve: Okay, so one thing also I was going to ask you, was in regards to Facebook when you are posting your posts, do you actually post from your old library or do you just post your new posts, how do you kind of work your own stuff in there? Bob: Yeah, that’s a really good point. We do both actually because so much of our content is ever green, you know an article that was posted three years ago that’s just as relevant now, it’s like it’s a great opportunity to share something like that on Facebook. So, what we did is a lot of those posts don’t have good graphics, so we kind of recreated a new graphic for it just to make sure– did a look over to make sure it’s okay, it’s updated enough. You know we would post some of those older articles on Facebook as well as the newest stuff, and that really, really helped because a lot of those older articles that were really popular and really good, the Facebook audience may never them, so they should be shared. And a lot of those were some of our best traffic generators from Facebook. Steve: Okay, and do you find that you are doing the same thing with twitter as well because it’s kind of a similar medium? Bob: It is, twitter I– my kind of approach with this and a lot of aspects in my business is I try to find out one or two things that are working and focus all my energy on that. I mean twitter I focus no energy on. Bob: It’s on of the things that we– I don’t know we’ve seven or 8000 followers and we just get like next to no traffic from it and probably because I’ve never used it well and I never spend enough time to figure out how to do it well. I’m not very engaged, I’m not very active on it and the audience obviously knows that. So, we have a twitter account and so people who do follow us and want to see our latest article that’s for those in, that’s it. Steve: Okay, so you don’t do the same thing, as you do with Facebook where you are constantly posting older twits and post older stuff and that sort of thing? Bob: well, we are in a little bit and the only reason that we are is because of buffer and all I have to do is press an extra button and it goes to twitter as well. So we are doing some of that but the energy behind in creating and engage twitter audience is never been present. Steve: Okay before we kind of got started with this interview, you also mentioned Pinterest, so how have you actually leveraged Pinterest for personal finance because traditionally we use it a lot for our online store because our products are just naturally suited to it you know but I wouldn’t necessarily think of personal finance being related to Pinterest if you understand what I’m asking. Bob: No absolutely and it’s funny I mean I’ve had a ton of people tell me ‘oh you shouldn’t waste your time on Pinterest, you’re never going to get any traffic from them. It is when the girls just want to see clothes and cookies and whatever else’, and while there is some truth to that, there is a ton of– it’s just– I just had the stat the other day. The number of pins– the total number of pins that had been pinned on Pinterest I think has doubled like in the last six months, like something just astronomical like that where it’s exploding you know. It’s still on its exponential curve where it’s growing so fast and we have enough– I mean there’re definitely some articles that will never the light of day I mean wherever. Some of the benefits have a self directed allay or something, it’s like I don’t ever expect to gain any pins on that, but there are enough articles that I think we can make work that clearly some people are pinning and we’re just trying to leverage those as best as we can. And so I know we’re not a fashion company or we’re not a food blogger or anything like that, so we probably won’t be able to get the amount of traffic that they get. But like we’ve talked about I’m just trying to diversify those traffic streams as best possible, and I want to milk it for all we can get out of it. Steve: So, just curious which one of your finance posts have done the best on Pinterest? Bob: Well, the interesting thing about Pinterest is when you get pinned by somebody who has a huge, huge following then it’ll get pinned by a whole bunch of other people, so it goes in its kind of viral waves, and so ironically– I mean it may be it isn’t that ironic I don’t know, anyway the best article that we’ve had so far with the most pins is an article about how to pay up your mortgage early you know which that makes a little bit of sense to me, I could see some people being interested in that, but what shocked me was that the graphic was just terrible. I mean just terrible chissy stack photo and in tiny you know it’s like 100 pixels by 100 pixels or something, and that’s what somebody pinned and then hundreds of other people pinned it and so ultimately it’s led to I want to say it’s like well into the five figures of pins and– so anyway it’s sent us a lot of traffic. So that one has done the best, there’s another one about– that we wrote about some legit work from home jobs– it’s done pretty well. Any kind of idea Y thing like I mean that works pretty well as well. Steve: So did you do anything to get these pins or were they just kind of random? Bob: Well, what I’ve learned about Pinterest is there is a random aspect of it but what you and I and any other blogger or really anybody with a website can do to help facilitate it, is to create an engaging graphic for anything that we want to get pinned. And I’ve noticed that the more I’ve done that, I’ve gone back to a lot of older articles and just created better graphics for them, I’ve layered to text on them just so they– others stand alone kind of almost like a business card for that post, and in taking that approach and getting a lot more of– a lot better graphics for these posts, it just sets them up to succeed. Steve: yeah, yeah do you have a big following is basically what I was getting and how important was that in developing your Pinterest traffic? Bob: well we don’t and that’s what’s really interesting to me, like we have 2500 fans on Pinterst right now, but our traffic– our traffic has gone up at least four times from Pinterest just over the last two months, and the main thing we did was just create better graphics for all these already popular articles. So, it didn’t come from us growing our Pinterest audience which really surprised me and we’re trying to that as well, but really even if you don’t have a Pinterest page for your blog or your website, even if you just create better graphics, you are going to get more Pinterest traffic. Steve: Okay, you know one thing I actually forgot to ask you about Facebook was kind of how you’re leveraging that traffic for your blog as well. You mentioned that the majority of posts aren’t going to your blog, so what is your master plan with your Facebook account? Bob: Well, that’s something– so my first goal was to grow the audience and then– and as I was growing it you know I was seeing a little bit of traffic increase but nothing that was making me excited, and then probably within the last month or two, I’ve been experimenting some more and we’ve really, really upped our traffic and interestingly and this works out really well, the same type of thing works really well. Just really good graphic and so we’ve been publishing our posts and using some kind of captivating graphics or something like that, and it’s really helped a lot. And we’re you know not to get too technical but basically when we were posting the creating the post on Facebook to link back to our article, we post it as an image, and then we include the link in there, and then maybe I’ll say one line about it you know and or something like that. But the important thing that I’m seeing is that we’re posting the graphic as an image instead of as a post. So, by contrast if you just dump any URL on the Facebook you know what you’re writing about, what you’re talking about right now, it creates its own thing and it’s smaller and it doesn’t seem to get nearly as much engagement for us. Steve: So, let’s get technical for a little bit because I’m actually curious about this. So I’ve seen different strategies, so some people post the graphic and then the link and the description. Some people post just the graphic and then they put the link in the comments because I think Facebook kind of downgrades any sort of post with a link in it. What have you found? Bob: I honestly haven’t heard that, so what we’ve always done is the passing you mentioned where we post the graphic and then the link is in the description, but I’m definitely going to try that out yeah because I haven’t heard that and that would be awesome if that just come through. Steve: I was just curious if you had tried some of those things because yeah I have noticed that my Facebook fan page– they basically downgraded the amount of reach that a post gets, at least for mine, I don’t know if you’ve experienced the same thing. Steve: Okay and so has that kind of diminished your efforts at all on Facebook like I know when I saw that happening I was like okay why am I focusing my efforts on Facebook if it’s not returning. Bob: Yeah, well it’s funny because for us right as we were going up Facebook was pulling down the reach, so they just like kind of crossed to where I didn’t see big drop, so I think it was like in December they made a big change and our Facebook– our fan base was growing a bit at that point and we were getting more traffic from it, so I didn’t see much change throughout the whole thing, but I guess had they not changed I would have– we would be getting a lot more traffic. Steve: yeah, so let’s switch gears a little bit and talk about your latest creation Pro-Blogging secrets, so great book by the way. I just bought it and I left a review for you. Steve: My main question regarding just blogging and I’m sure a lot of the listeners want to know this. It seems like the blogger sphere is kind of getting really saturated these days, do you– and we kind of touched upon this earlier in the interview, but do you think blogging alone is enough and kind of if you were to start your blog brand new today, what would you have to do to get it to the same point as where ChristianPf is now? Bob: Okay first question, it is getting saturated I mean there are– I just read a stat the other day there are over 60 million WordPress blogs out there, and that’s just WordPress, I mean WordPress is the biggest I already slipped it. Yeah there is a lot of blogs, but I really don’t– I don’t see it as a zero some thing you know I don’t see it as a pie and we each have our own slice of the pie, it’s just kind of like– to me it’s like if you are sitting in a room, we’re not going to run out of oxygen, you know what I mean? Bob: And I kind of feel that way about blogging, I think there’s plenty of room still for all of us. I think the most important thing is for people to find you know and here’s all time but find your own unique thing, your thing that sets you apart, your thing that you’re really good at, the thing you’re excited about, the thing you’re passionate about, and when your competitive advantage in all that. I mean what do you know that most people don’t know, and what kind of insight can you share about this that most people can’t. I’m sure there will be some other people who can, but that’s okay but you know it’s okay to be similar to a few but you don’t want to be similar to 10,000, and that’s where I think some bloggers get themselves in trouble in when they are really just kind of adding to the noise when they are basically just doing exactly the same thing as 10,000 other blogs. So you got to find some way to set yourself apart and be able to be different. Steve: You know we touched upon some of the different mediums as well. Do you think that blogging by itself is kind of enough if you have a unique voice and that sort of thing or do you feel like today since there are so many blogs like even if you pick anything, you probably will find you know hundreds of blogs in that same niche, and often times even if your content is really awesome it’s– you still have to get it out there. So what are some of the strategies early on if you’re just starting today, what would you focus on? Bob: Wait, okay you asked me another question before that? Steve: I’m just bombarding you with questions, I apologize. These are just all stream of consciousness by the way, I don’t have any of these written down so let’s actually go with that because what I’m trying to get at is if you’re going to start today how would you actually get the word out about your– let’s say your content is really awesome and that’s a given, how do you get it out there? Bob: You know for me, okay so here– I’m just excited about the things that are working for me right now. So anyway Pinterest I’m absolutely thrilled about because we just watch our traffic month over month increase pretty dramatically by using really good images. Now obviously we have a platform that we’re jumping off of so it’s making it a lot easier to kind of get the momentum going. But if I were starting over again today I would start a blog, I would get five– probably five really good articles specific to my niche really, really helpful stuff. And I would go out and try to connect with other people on the niche, other people in maybe somewhat related niches and find places where I can guest post, and just find any place I can go right and get a link back to the site and not even necessarily for SEO purposes, but to get that traffic like that’s what I think I would do right now if I was starting over. Beyond that I would– something else to say because I say this all the time because I– if there is anything I regret, it’s that I didn’t start building email lists at the beginning. Bob: It took me years to get serious about building an email list and so anyway that’s the other thing I would start doing. Every single person who comes to my site, I want them to at least think about joining my email newsletter. I don’t want them to leave my site not knowing it was an option. So anyway those two things I would spend a lot of energy on and you know to be honest it’s– most blogs it’s a slow build, it’s the overnight successes I mean are just pretty stinking rare and if you’re getting into this you can’t count on that, you got assume it’s just going to be a long slow thing and be excited about having you know a hundred visits to your blog the first month. Then if you get 150 the next month, great we have some progress you know and just use that progress as momentum to keep you going, and as long as it’s going up month over month you’re doing great. Steve: Okay and you know one thing I actually forgot to ask you about is you mentioned email marketing. How do you actually run your email list? Do you have a bunch of auto responder sequences, do you blast out every article to your audience, how do you kind of run it? Bob: We have few different things going on, so we have a daily newsletter which is the biggest portion of our list total and then we have a weekly newsletter. The weekly one sends out once a week, then the daily one sends out every time we post. Beyond that we have the people– once people sign up for the courses they are automatically part of our weekly list, so they will get an article from us every week, and so just depends. So basically the people you’ve signed up for daily will get whatever we post sent out to them, the people who sign up for weekly will get that as far as all the email courses– those are all set up on overall responders, so it’s very automated and pretty simple ones that their niche or work is done setting it up. Steve: Okay and in terms of the weekly guides, are all those on the auto responder or do you just kind of– how do you pick one article that goes out for the week as opposed to your daily guides? Bob: Well, this is essentially in auto responder. It’s an all assessed driven thing, so it just sends whatever like a summary email with the three articles or four articles that were posted that week with a summary of each one of them. Steve: Okay and then the daily one is just is each individual article in its entirety or? Bob: Well it used to be and I’ve since changed, I mean created teasers out of them, so we send a graphic and then little teaser linking to the article itself. I used to have a whole article in there and I decided I’m going to try this and see what happens if I just put a teaser in. And we did that and instantly we are getting thousands more visits every time we sent out something out and I’m like why did I not do it sooner. And I was waiting for the response; I want to see if anybody was upset, I didn’t get a single email from anyone complaining about it so. Steve: Okay and you know at least for me I find that whenever I said out a blast I tend to sometimes shed subscribers right and so for the daily guides I was just curious what your unsubscribe rate is versus the weekly guides. Bob: I don’t know like the overall unsubscribe for it I mean all I know is that we were gaining more everyday than we were losing, so that’s all I’m excited about. I mean it’s considerably more, we are gaining a lot more. I want to say on the daily one, we probably lose around two, three, four, something like that each time we send out one and each day I think we’re picking up about 30 for that list so. Steve: Okay cool and then so whenever you have like a book launch or what not you kind of just blast it out and let everyone know you have another Amazon book out right? Steve: Okay, cool well Bob so we’ve been talking for like around 40 minutes and I don’t want to take up too much of your time plus I have to get to work. But you know if– so let’s talk about your book and if you can provide email address or twitter account where people can reach you if they want to ask you questions, that’d be great. Bob: Sure email address is bob@christianpf.com and the book you mentioned is ‘Pro-Blogging secrets’ that’s what it’s called. I just launched it about a week or two ago. Essentially it was a follow up just quick story, the article you read that I told you was a ChristianPf4/blogging that bigger that big article, the 8000 word article I got started on a whole book thing because I decide I’m going to turn this into a kindle book just to give another way for people to download it and– in any way I thought I could just list it on Amazon for free and it turned out Amazon said no you have to charge 99 cents bla bla bla. So anyway so I headed up there and I still even at 99 cents they had to turn down people downloading it. So anyway so this book now is a follow up to that and so I go into a lot more kind of specific techniques and things that I’ve used over the years to grow our audience and to increase earnings, and I get really, really specific lots of how to step by step things. Really a lot of this stuff is just the secret source I feel like I’ve learned and just kind of want to share with people so. Steve: Yeah just for the listeners we’ve only scratched the surface regarding what’s inside this book so I highly recommend that you guys all go and pick it up. So hey Bob thanks a lot for your time. Steve: It’s a pleasure talking to you, you know normally we only see each other once a year, but Thinkon is coming up so hope to hang out with you there some more yeah. Okay man take care Bob. Bob: All right, thanks Steve see you. I’ve known Bob for quite a while now, and I really love his story. 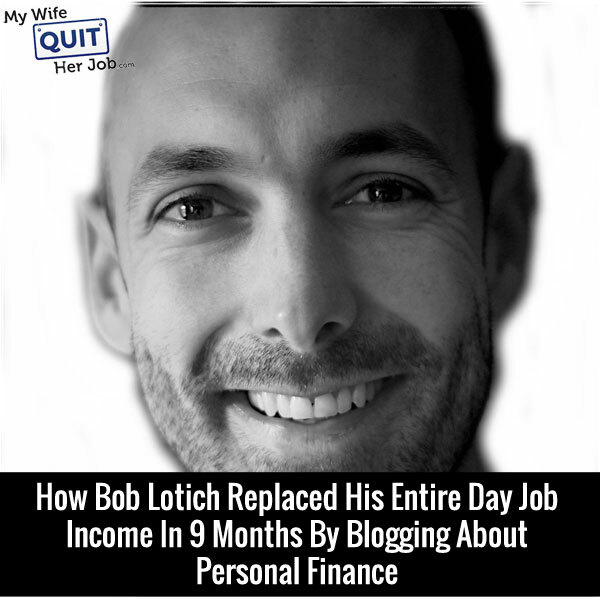 Basically he was stuck in a major rut financially, decided to take action and turned his life completely around. Now today his blog gets an insane amount of traffic and his brand new book is very well written and full of useful strategies on how to grow your readership, so I highly recommend that you go check it out in the show notes. So for more information about this episode go to mywifequiteherjob.com/episode31 and if you enjoyed listening to this episode, please go to iTunes and leave me a review. When you write me a review, it not only make me feel proud but it helps keep this podcast up in the ranks so other people can use this information, find the show very easily, and get awesome business advice from my guests. It’s also the best way to support the show and please tell your friends because the greatest complement that you can give me is to provide a referral to someone else either in person or to share it on the web. Now as an added incentive I’m also giving away free business consultations to one lucky winner every single month. For more information go to mywifequitherjob.com/contest. And if you are interested in starting your own online business be sure to sign up for my free six day mini-course where I show you how my wife and I managed to make over 100k in profit in our first year of business. Go to www.mywifequitherjob.com for more information and thanks for listening. Thanks for listening to the My Wife Quit Her Job podcast where we’re giving the courage people need to start their own online business. For more information, visit Steve’s blog at www.mywifequitherjob.com. This episode was packed full of useful information on how to grow a blog with social media. I’m going to check out Bob’s book and see what other insights he has to offer. Amazing! That’s just funny. The guy on his site says, literally: “It took me years to earn a living from my blog” – obviously wants to sell you his program where he’ll teach you how to save all that time and effort. Here, it says he did it in 9 months – so that you think he’s awewsome and buy his sh*t. These marketers are all the same: just a bunch of liers.